Stock the medicine cabinet, be prepared to use a few sick days, and get your flu shot because flu season is officially upon us. If you’re a business owner, manager, or human resources professional, you know this isn’t all you need to do to prepare for sick season. You need to think not only about yourself, but also about your employees, because if the virus becomes an epidemic in your office, you could be stuck in productivity purgatory until St. Patrick’s Day. But how? Implementing a smart employee wellness strategy is the very first step to a healthy, safe workforce. How does the flu affect businesses? So we all know the flu is unpleasant, especially when it affects us directly. But have you ever stopped to think about how a particularly bad flu season can alter the economic success of your business? 2017 was one of the worst flu seasons in years, and, unsurprisingly, it took a serious toll on the economy and the population at large. In fact, the Centers for Disease Control and Prevention (CDC) reports that the annual impact of seasonal influenza is broad, costly, and damaging—it equals 1 million hospitalized days, 31.4 million outpatient visits, and about $6.2 billion per year in lost wages. With sick, unproductive, and unhappy employees comes fewer business gains, of course. When teams across the U.S. are knocked out with the flu—taking an average of four to six days off per employee during flu season—businesses suffer. Studies show that employers could lose out on more than $9.4 billion in productivity when flu season gets bad. But here’s the thing: your workers are humans, and there’s nothing anyone can do to 100 percent safeguard against the virus, especially when the flu shot varies in effectiveness from year to year. But the flu shot does work and it should be a fundamental part of your flu season protocol. With these things in mind, you have to do everything you can to ensure that if an employee does get the flu, it doesn’t spread around to the rest of the office. A nasty flu strain has a detrimental domino effect—if one worker goes down, it’s likely to knock down many more in its wake. The key is to implement an effective employee wellness program and to come up with new ways to prevent the flu from infecting your workspace in the first place. If you don’t already have an employee wellness strategy in place, now’s the time to do it. These programs may offer health screenings, education, and goal-setting options to employees, usually with some sort of incentive system in place. 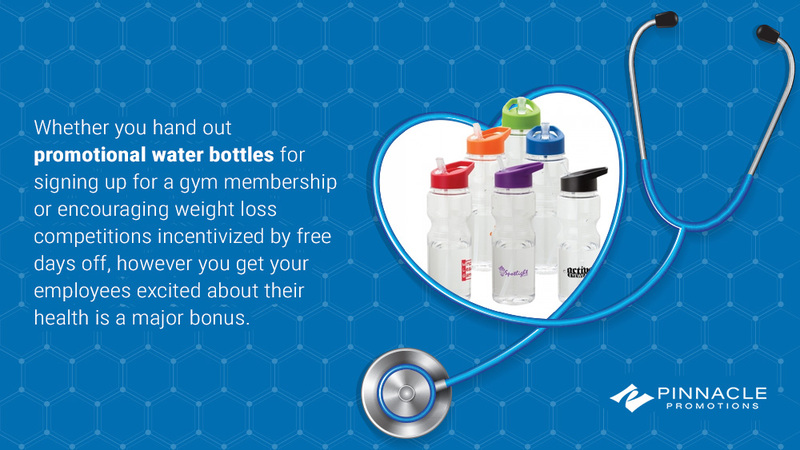 Whether you hand out promotional water bottles for signing up for a gym membership or encouraging weight loss competitions incentivized by free days off, any way you can get your employees excited about their health is a major bonus. Not only do healthy employees equal fewer sick days (and more economic gains for your business), but they also save you money because they help to curb insurance costs. Employees who are healthy and prioritize their well-being cost you less in insurance claims and premiums. And, according to the Gallup State of the American Workplace Study, employees with a high well-being have lower healthcare costs. But keeping your employees healthy doesn’t only come down to physical health. The Gallup study showed that engaged, incentivized workers lead healthier lives. Engaged workers—defined as those who are enthusiastic, committed, and involved in their workplace—tend to have fewer chronic health problems, including high cholesterol, high blood pressure, diabetes, depression, obesity, and heart attacks. Thus, putting a well-thought-out employee wellness program into place requires components that focus on employee happiness and physical well-being. One thing you can do to safeguard your most valued employees from getting sick during flu season is to provide incentives to employees who get a flu shot. You can either have your employees get flu shots on their own and provide you with the receipt or implement a mobile flu shot clinic onsite where employees can go and get vaccinated during the workday. These onsite programs are offered specifically for businesses by many of the major healthcare systems and pharmacies. Most insurance policies cover the flu shot so there is no extra cost to the employee, but if you have part-time or contract employees not insured through your business, make it your job to ensure that they have access to free flu shots. Be sure that you pay for all employees to be vaccinated at your onsite flu shot clinic or provide every single worker with a free flu shot voucher, whether they work two hours per week or 50. Pay for the time employees take to get vaccinated. Here are a few more ways you can get your team to take the flu shot seriously. Load up on wellness giveaways—Free gifts, especially corporate giveaways, are always smart incentivizers, whether you’re encouraging your workers to hit sales milestones or improve their health and well-being. Handing out wellness-centric freebies is a budget-friendly way to get your team to participate in the flu shot party—who doesn’t love free headphones, water bottles, and pedometers? Give the people what they want—What two things do employees love more than anything? Free food and time off. Hosting a free team lunch or offering a shortened Friday workday for participants are popular ways to get your workers vaccinated for the greater good of the office. Set goals so that employees have incentive to encourage each other, like a whole day off if every single employee gets the shot. Make it into a competition—A little bit of healthy competition is a great way to improve employee morale. At the beginning of flu season, create teams (or segment your workers by department) and encourage each group to get vaccinated. The team that gets the most vaccinations wins a special company gift or award! If you work in a healthcare environment, there’s a good chance that your employees are already required to get a flu shot based on company policy. 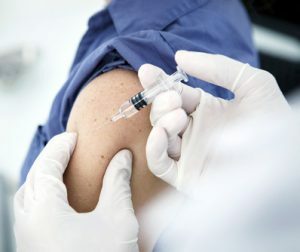 Many of the country’s leading healthcare authorities now mandate flu shots to their own employees, including Johns Hopkins and The Cleveland Clinic. Usually, this is because healthcare workers interact with particularly vulnerable populations, including the elderly, babies, and sick people with compromised immune systems who cannot risk contracting the virus. Though required flu shots are somewhat controversial, you may be able to require them in your workplace. Workplace laws and standards vary by state, but the Occupational Safety and Health Administration (OSHA) does condone mandatory flu shots and encourages flu-related education at work. However, there is still some murkiness about the issue, so unless your workers regularly come into contact with vulnerable populations, it’s probably best to choose incentive programs over mandatory ones and focus on educating anti-vaccine employees. 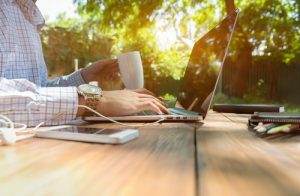 One of the greatest benefits of technology is that it allows many of us to work from wherever we are, whether that be our cubicle, our home office, or our bed. Allowing your employees to work from home when they’re sick is an effective way to lessen the germ pool in your office. Though the flu can be miserable and debilitating, there are days when team members might feel perfectly fine but are still contagious, so working at home makes more sense. Simply avoiding shaking hands with or hugging your co-workers isn’t enough to avoid picking up the flu. In fact, the CDC says that people with the flu can spread it to others about 6 feet away, so your employees can still spread it to other workers even if they’re quarantined to their desk. The CDC reports that most healthy adults are able to infect others with the flu about one day before symptoms develop and as many as seven days after becoming sick. Your best bet? If your employee feels a sickness coming on, let them log in from home. There are many jobs where remote work is simply not an option, including manual labor positions, factory jobs, sales jobs, and any profession that requires lots of face time. If you can’t curb lower productivity levels through loosened remote work policies, then consider being a bit less strict with sick days during flu season. Your policy should be clear—if you are contagious, don’t come in to work even if you feel totally fine. Being stingy with employee sick leave can wind up damaging you much more than it can benefit you. 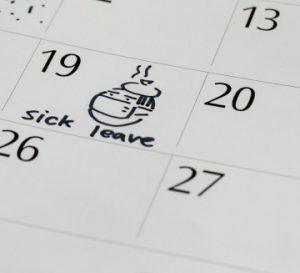 The Society for Human Resource Management (SHRM) warns that companies who hire those with no paid sick leave—including part-time and nonexempt workers—can experience a significant increase in employees reporting to work sick and spreading viruses. The solution? The SHRM encourages companies to modify their paid sick leave and offer it to all workers if an influenza breakout occurs in your business or region. If your business is inherently customer-facing or if you have an open-door policy and regularly invite in clients, prospects, friends, and employees’ kids, you’ll have more to think about than just employees when it comes to warding off seasonal sickness. Sadly, you can’t screen all customers and clients before they come through the door to make sure they’ve been vaccinated and are not a threat to your workforce. But you can provide incentives. 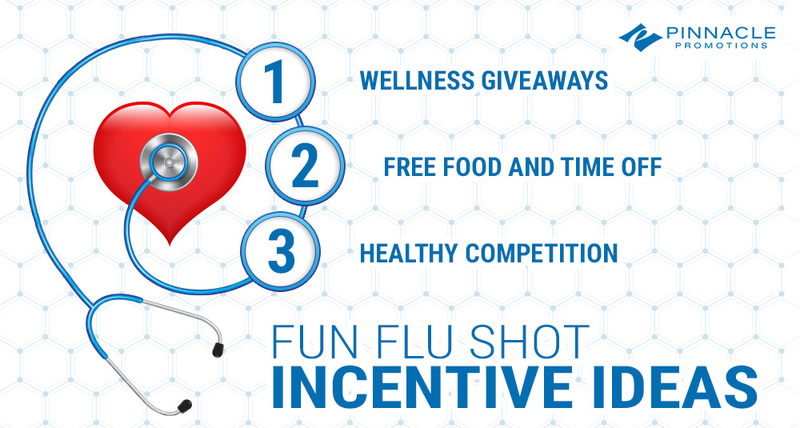 Hand out free vouchers, coupons, and discounts on your products to get clients and customers to join the flu shot bandwagon. On the same note, you can’t simply close the doors to the outside world until spring rolls around so that no employee is compromised. But you can be a little bit more strict about who you invite into the office. If your company tends to be lax about visitors, ask that the rules be tightened only during flu season to lower the risk of employee exposure. Even if you have the healthiest team in the entire world, you won’t maintain those high well-being levels if your work environment is germ-laden. As obvious as it is, make sure that your employees are educated about safe handwashing and germ protection strategies. The CDC calls handwashing the DIY vaccine, and for good reason—you can kill 99.99 percent of the bacteria on your hands with proper handwashing. The CDC recommends that homes and businesses offer easily accessible soap and water as well as hand sanitizer containing at least 60 percent alcohol at all times. Note that hand sanitizers are not as effective on greasy or dirty hands, so you should always wash your hands as well. Other things you can do to prevent the spread of viruses in your workplace include avoiding close contact with other employees, routinely cleaning surfaces and supplies with disinfectants, and allowing employees to go home as soon as they begin feeling ill.
As you’re implementing great ways to keep your workplace flu-free, remember that education is a major component of a good employee wellness strategy. Make sure that all of your employees know that there are many misconceptions surrounding this resilient virus, and that getting the flu vaccine will not give you the flu or make you feel sick. 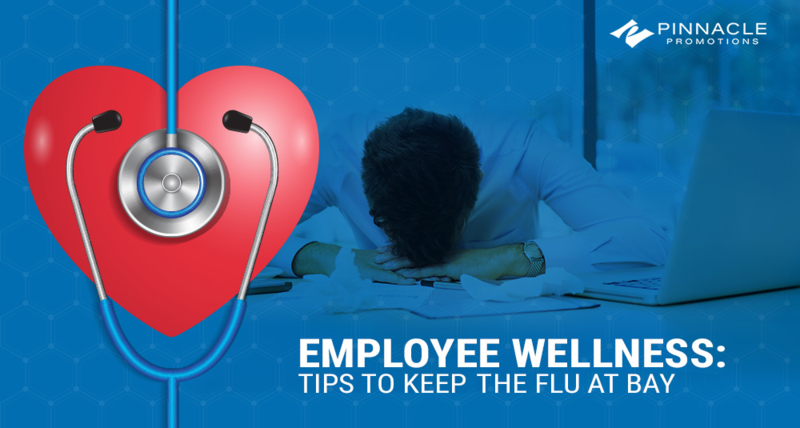 When you arm your employees with everything they need to beat the flu and provide a few standout bonuses, you’ll be well on your way to a healthy and safe workplace this flu season.